Some consumers who buy their health insurance through the Massachusetts Health Connector could see their premiums rise by more than 25 percent next year if the federal government makes good on threats to end certain subsidies, or if the fate of those subsidies remains unclear next week. With uncertainty around federal health care changes looming and the start of an open enrollment period right around the corner, the Massachusetts Health Connector and Division of Insurance have prepared two sets of rates for 2018 to account for the possible loss of revenue that would affect federal subsidies for plans offered through the Connector. The Connector must settle on one set of rates in less than a week and is preparing to advise members to shop elsewhere for coverage if it must use the set of higher rates that assumes the federal government stops making monthly cost sharing reduction (CSR) payments. The Commonwealth Health Insurance Connector Authority Board had canceled its September meeting — at which it typically approves plans and rates for the coming year — as the state worked with carriers to chart a pathway to deal with the uncertainty, and Health and Human Service Secretary Marylou Sudders said Gov. Charlie Baker has been lobbying for the continuation of CSRs, as recently as Tuesday evening. "Faced with this uncertainty and challenges, the Health Connector and Division of Insurance have worked extremely closely with carriers all summer to develop two potential pathways with the guiding principle of protecting members first and always," Sudders said. She said the loss of CSRs "could put our members and the coverage gains Massachusetts has worked so hard to achieve at risk." The CSRs are available for individuals and families with incomes up to 250 percent of the federal poverty level, or about $60,625 for a family of four. According to Massachusetts insurers, 244,400 enrollees in 2016 benefited from cost sharing subsidies that go toward lowering out-of-pocket expenses such as co-pays and deductibles. The fate of the CSR subsidies partially hangs in a lawsuit, House vs. Price, initially filed by House Republicans against the Obama administration. The Trump administration has also threatened to end CSR payments as a way to sabotage the Affordable Care Act and force Congress to pass health care reform. One set of rates assumes that CSRs are eliminated and would set higher rates for the Connector's silver tier of plans. Sudders said that option "would seriously disrupt coverage for up to 80,000 members." The second set of rates does not take the loss of CSRs into consideration. If the CSR payments are eliminated, members enrolled in silver tier plans — which, according to the Connector "have lower premiums but higher costs when you get health care services" — could see average premium increases of 26.1 percent, the Connector said. If the standard rates are used, the average premium increase would be about 10.5 percent. "It is our ardent desire that we can work with carriers to avoid exercising the higher rate contingency unless and until such a time as CSR withdrawal, if it happens," Health Connector Executive Director Louis Gutierrez said. Gutierrez said the Connector administration must decide no later than Tuesday morning which set of rates will be uploaded in order to meet deadlines associated with the Nov. 1 start of the open enrollment period. The decision does not require a board vote, but the Connector board will be notified of the administration's decision Tuesday morning. If the higher rates are used, unsubsidized members — those whose income is above 400 percent of the federal poverty level or who do not seek a subsidy — will be impacted the most, so the Connector has put together a strategy for reaching out to those members and helping them secure affordable coverage through other means, including encouraging them to shop for a plan outside the Connector. Affected members will be "encouraged first to shop directly with their carrier off-exchange, with messaging including contact information for the carrier" and will "be secondarily encouraged to shop for a different plan on-exchange, including at different metallic tiers, with messaging noting the benefits of comparison shopping and future subsidy eligibility," according to the Connector. The Connector board on Wednesday voted to give its final seal of approval to four carriers offering 14 dental plans and eight carriers offering a total of 52 plans for small group and non-group coverage. Members in plans from tiers other than the silver tier will see average premium increases from a low of about 7 percent to a high of as much as 20.3 percent for the platinum tier, 12.6 percent for the gold tier, 13.8 percent for the bronze tier and 10.2 percent for catastrophic coverage plans, the Connector said. The Division of Insurance is expected to make the details of the rate options public later Wednesday, Sudders said. In a letter to the congressional delegation Tuesday, Baker said CSR payments to Massachusetts are estimated to be $146 million and said the uncertainty around the payments is a threat to tens of thousands Massachusetts residents. "As we approach the start of Open Enrollment on November 1, it is critical for federal cost sharing reduction payments to be resolved affirmatively in order to maintain market stability and to constrain rate increases," Baker wrote. "If Congress does not act to stabilize the insurance market by funding the CSRs, then 80,000 Connector members would directly experience premium increases of 20 percent or more in addition to potential disruption in their health care provider." 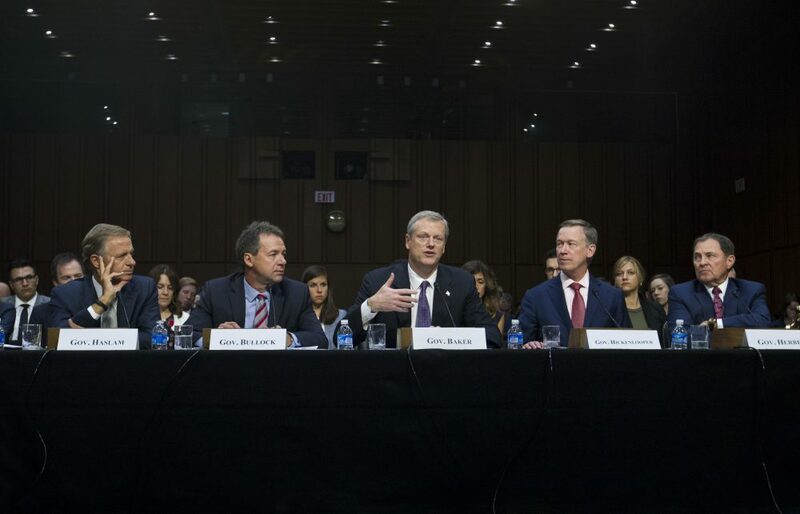 Baker traveled to Washington, D.C., last month to testify before the U.S. Senate Committee on Health, Education, Labor and Pensions about the importance of continuing CSR payments, a topic on which he and U.S. Sen. Elizabeth Warren found common ground. The governor testified that Congress should appropriate money to cover CSR payments for at least the next two years to give insurers who are working to set rates for 2018 and 2019 a modicum of certainty as to the funding that will be available while longer-term cost controls are debated. Tennessee Sen. Lamar Alexander, the HELP Committee chairman who is leading a bipartisan effort to stabilize health insurance markets under the Affordable Care Act, said Tuesday that continuing cost sharing reduction subsidies for two years is now a key part of a package he is negotiating with his Democratic counterpart, Sen. Patty Murray of Washington. "The elements of that are continuing cost-sharing payments for two years and to give states meaningful flexibility in the types of policies they can write," Alexander said Tuesday, according to The Hill. Massachusetts has another option that could blunt the impact of changes at the federal level. On Sept. 8, the day after Baker testified before Congress, the administration submitted a Section 1332 waiver seeking to establish a Premium Stabilization Fund in lieu of CSRs and authority to waive CSRs and instead receive any federal premium tax credit savings that will accrue as a pass-through, which could be used to stabilize premiums via direct issuer reimbursement, according to the Connector. A Connector official said Wednesday those requests typically take about seven months for the federal government to rule on, but that the Connector requested "aggressive fast-track review" and an answer by Oct. 15. Massachusetts is not alone in dealing with the challenges of an uncertain future for CSRs. In California, the Division of Insurance similarly placed two sets of rates on file and the exchange there is planning to use the rates that assume elimination of CSR payments if the uncertainty persists beyond its open enrollment deadline. Washington also approved plans that reflect two sets of rates but is planning to use the rates that assume continued CSR payments. Maryland also approved plans that reflect rates assuming continued CSR payments.